This print by Brian Clinton pays tribute to arguably the greatest goal kicker of all time - Tony Lockett. Featuring artist images from his early St Kilda days, this print is certainly a must have for any Tony Lockett or St Kilda fan. Secure your piece of St Kilda history! This stunning framed piece celebrates the amazing St Kilda and its 2016 season. Including their 2016 team photo, along with the club's 2016 playing fixture, with the names of each of the players listed below. 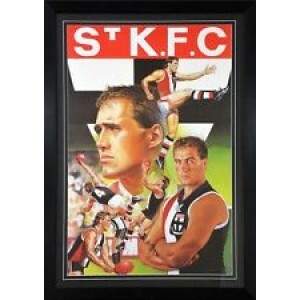 This is perfect for any true St Kilda Football Club fan wanting to own a piece of Saints history.